Feedback: 61 comments - leave yours! My visit of a 8000'/2400m high cheesemaking chalet in the Swiss Alps where cheese is still made like 300 years ago - and not one tourist in sight! Can you climb a mountain with your photo gear?, asked Joseph Werlen. I said I could. Anything for proper cheese. Well then, leave the car at the bottom of the Nüffenen/Novena path and walk up in the Lengtal until you reach the place they call Vorderdistel. They make the cheese in the second hut. But take your time - it's a steep climb. 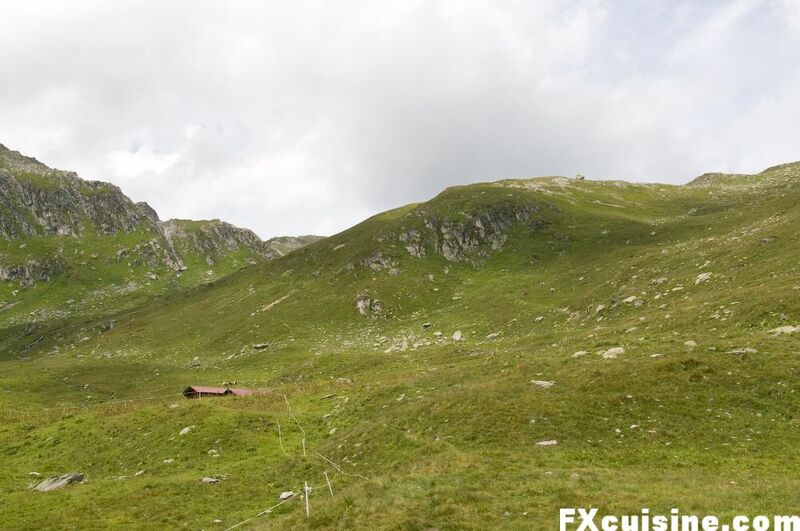 I slept in Münster, near the source of the Rhone river and on August 1st, Swiss National Day, I woke up at 5 AM to drive to the bottom of the Nueffenen path, the bit of mountain that connects my birth canton of Valais to Italian-speaking Ticino. I briefly stopped to knock on Münster's baker back door to buy a dozen croissant to bring to the cheesemakers. When the road stopped I took my 40 pounds of photo gear on my back and set out to walk. 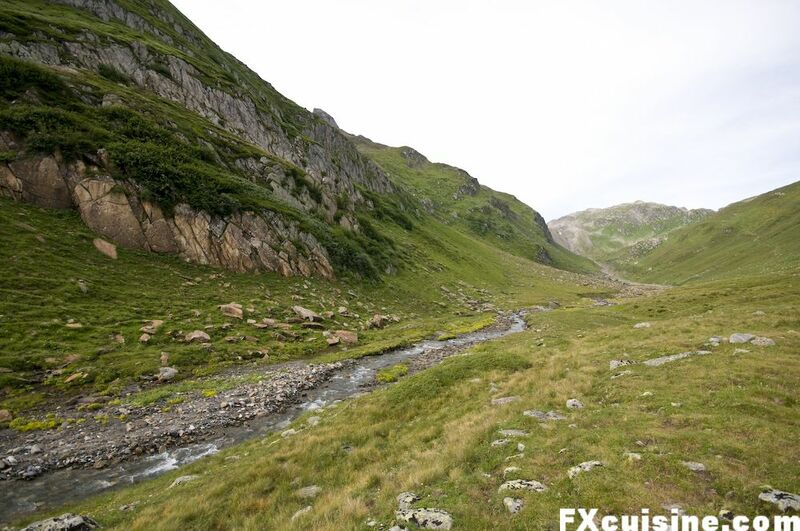 The Lengtal ('long valley') is very flat at first, but it starts to become steeper and steeper as you climb towards the former glacier. The border with Piemonte, Italy, is just over the ridge. There is no real path. A few stones indicate that you are on the way, with the special sign they use to indicate the sort of treck that tourist offices call 'For confirmed mountaineers only'. As it becomes steeper and steeper, I start to wonder what sort of mountaineer I am. As I draw closer, the 'path' is so narrow you can barely put one shoe in it. Better not look sideways as eternity is grinning from below. All I had was three place names Lengtalkeller in Vorderdistel, Lengtal with some vague directions given in German over the phone. I continued. Christian welcomed me. If you met him on the street you'd think he was on his way to a rock festival. But no, these guys work for a solid 90 days up there on the Alp, come rain, come sun. That's more than a submariner. Christian is from Bavaria. I gave him the croissant. Very friendly guy and such a smile. But life up there must not be all fun. The cheesemakers are shacked up 7 in a single room in spartan accommodationfor 90 days. They were joined by one of the shepherds' sons who came up from Luzern for 2 weeks of fresh air and hard work. As I entered the stone hut next to the milking station, Jenny was busy turning over the curds. 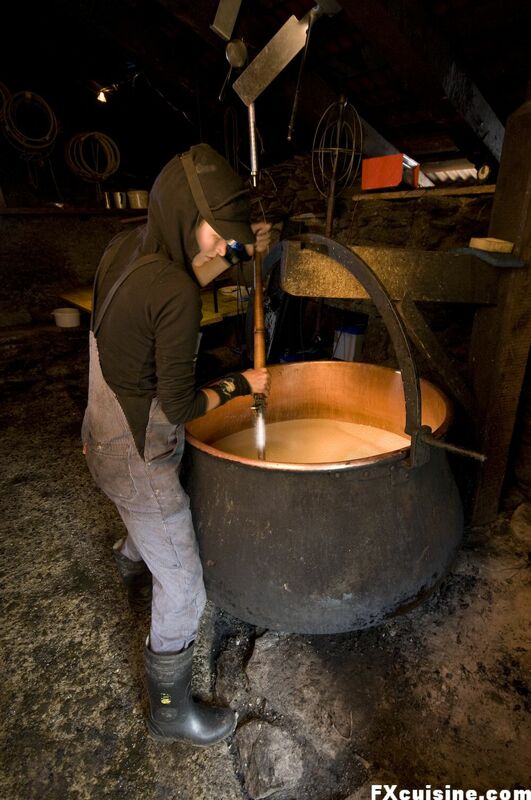 She had woken up at 5h00 to place 800 liters / 200 gallons of milk in a large copper cauldron with a bit of yogurt-like starter culture to start lactic fermentation. After a couple hours, she added the rennet to curdle the casein in the milk. Satisfied with the curdling, she used two large scoops to turn over the curds. 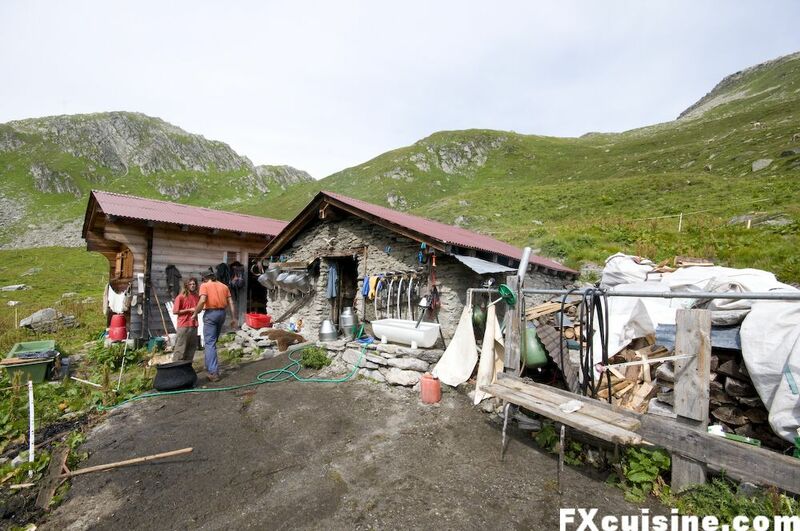 See a static partial panorama of inside the cheesemaking chalet. Using a giant tranche-caillé or guitar, Jenny cuts the curds into tiny grains. She inspects her grains constantly until they are the size of a grain of wheat. Jenny reaches for the axe and I reach for cover - an attack of cabin fever, no doubt. But no, she swiftly chops down some wood and starts a fire. There is no electricity, no running water and no sewers up there. 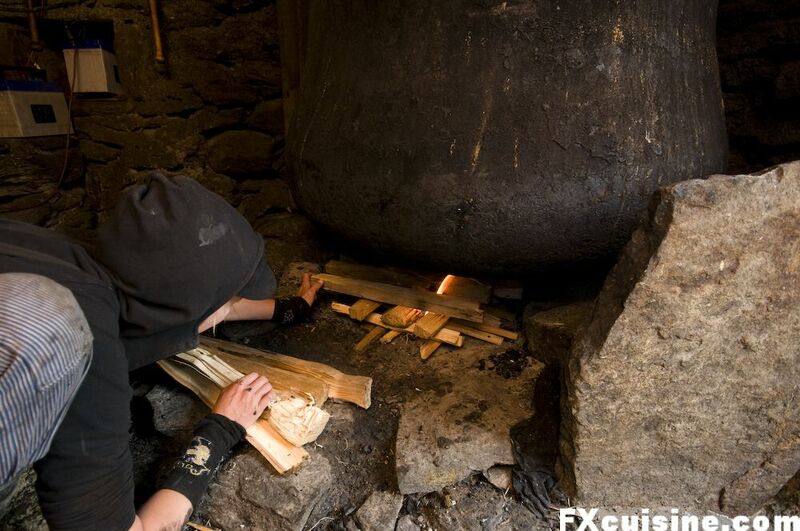 The wood had been brought in by helicopter a season ago, and all the cheese is made on the wood fire. She places a giant lawn mower on top the caldron and attaches the strings to a car battery. The blades start to slowly mix the curds as they heat up. 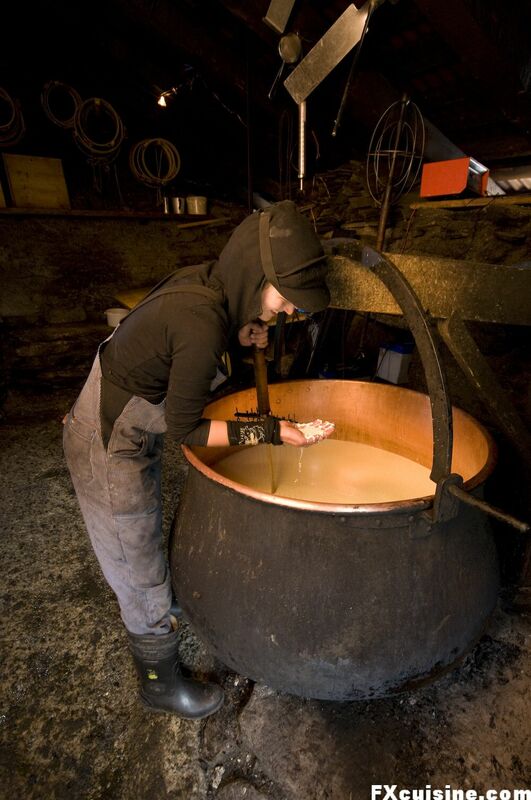 While the curds cook, Jenny rushes out to quickly wash her cheese forms in the cows' water trough. 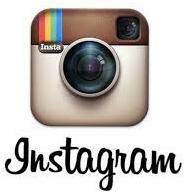 I quickly follow her when the open hearth fills the chalet with smoke. Cheesemakers are obsessive about cleanliness or they change profession quickly. If you tolerate any kind of impurity, bacteria or hair to fall into the cheese, it will show as a nasty green or black scar within days.